Edmonton is the “City of Festivals” and during the summer, they just keep coming. This past weekend was the Dragonboat festival. 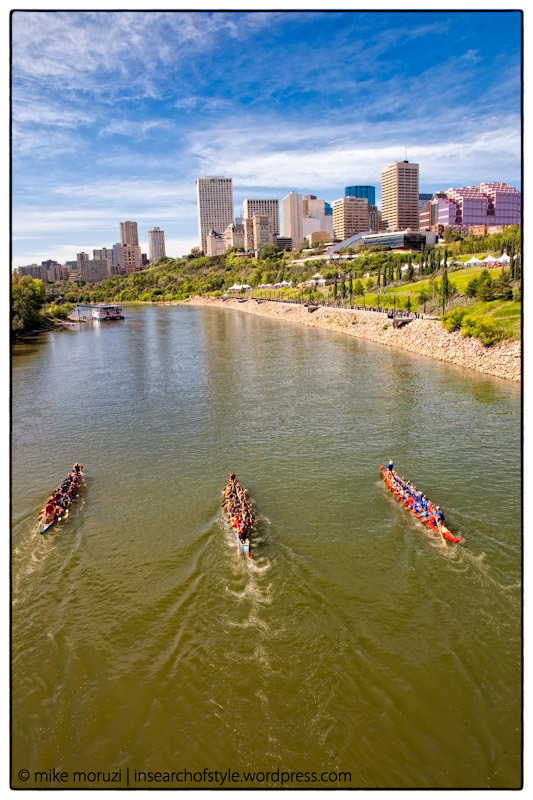 It takes place on the North Saskatchewan river, the river that bisects Edmonton into the north side and the south side. The river valley is a great spot to spend the kinder months of summer (which at this stage seems to be just August! ), though apparently not at night, but that’s another story I suppose. On Friday night a thunderstorm was forecast. I’ve been keeping an eye on the forecast because I’ve been wanting to get out and try to shoot some lightning. By 10:00, no storm had arrived. We had a bit of wind, but that was it. I gave up on the storm arriving thinking it was blowing past the city. At 10:30 though, the storm arrived full blast when the rain started bucketing down and the thunder and lightning closely followed. I hightailed it out of the house to my planned vantage point above the North Saskatchewan River looking back into the city. By the time I got there, most of the lightning had passed and it was just lightly raining. There were a couple more flashes of lightning, but they were mostly over the clouds. So, no lightning photo, but I did get several pretty average (whoopee!) 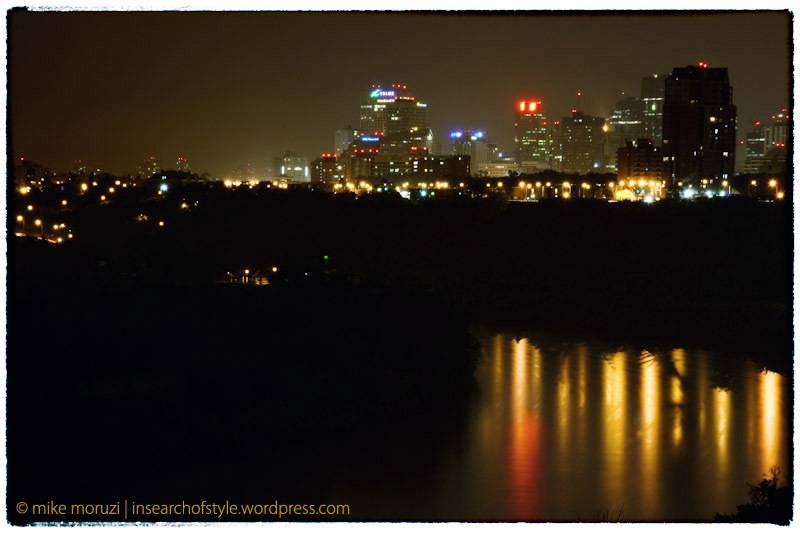 photos of the Edmonton city skyline at night (in a rain storm). Here’s one of them. Oh well, better luck next time. I think I should go back to my series of kids playing composites. I have two more scenes shot, but haven’t had time to put them together yet. I’ll return to them on Monday. Note: This is a scheduled post because we’re having a technology-free day (see Day 151) today so I posted this on Saturday.